Many web developers run local web servers to test website changes without affecting the live websites on the Internet. They can also be used for numerous other purposes from offering access to files or information in a local network to creating the next Facebook or Google. All had in common that they were relatively easy to setup and configure. Fortitude HTTP is another web server for the Windows operating system that makes a web server available on Windows after installation. The web server is immediately functional after installation and it is possible to connect to example websites by pointing the web browser to http://localhost/. The http management console is used to configure the web server locally. It displays the hosted websites, their settings and global settings in the left sidebar. 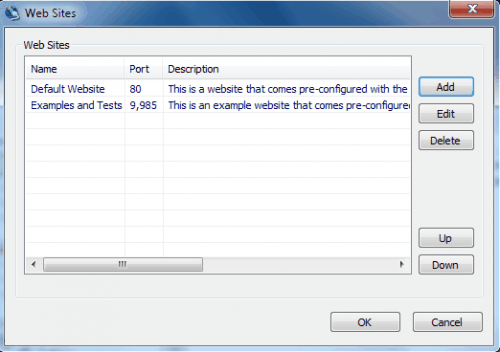 New websites can be added easily by right-clicking the websites entry and selecting Configure from the context menu. Here it is possible to delete, add and edit websites. A name, port, root directory and description can be added in the web site creation menu. Each website can be configured individually from a maximum connection limit and buffer size to the server admin email, root login details, scripting engines (supported are python, php, perl and vbs), SSI and CGI. The global settings are identical to the local ones, with the difference that they are applicable for all web servers. The only thing missing is a database server like MySQL which needs to be installed separately. Fortitude HTTP is an easy to setup web server for Windows. The lack of MySQL or a comparable database makes is negative, everything else is there to get started developing or maintaining websites right away. The web server is available for 32-bit and 64-bit editions of the Microsoft Windows operating system. I’m looking either to host, or have hosted, a web page that is capable of running my curl script. Incidentally, the curl script creates a file on the drive. Why would it not support cURL?